1. Cavity: 1 x 1. 2. Part resin: PP. 3. Core steel: P20 (28 ~ 32HRC). 4. Cavity steel: P20 (28 ~ 32HRC). 5. 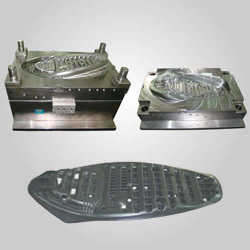 Mold base: LKM standard. 6. Ejection: guiding ejection, and fell off automatically. 7. Unit: metric. 8. Feed is by cold sprue with direction gate. 9. Cycle time: 85 ~ 90s.